Katlu, a traditional sweet dish hails from Gujarat which is popular during winter months and is wholesome and loaded with nourishment. 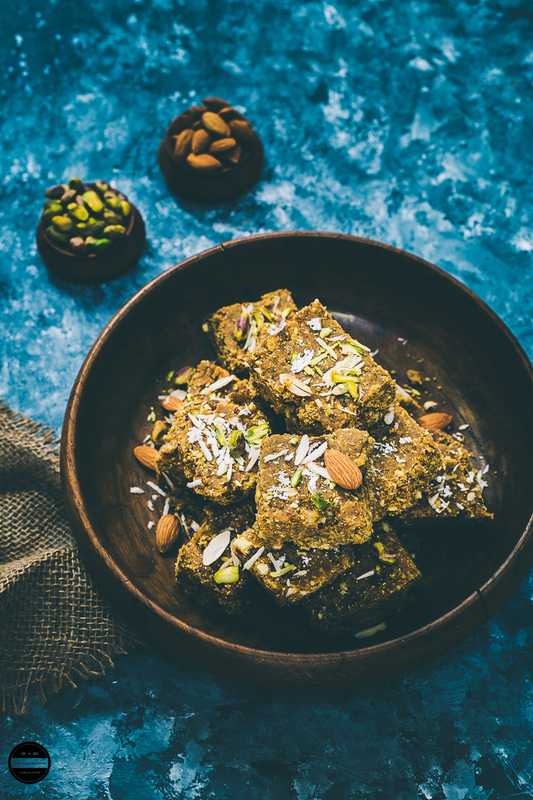 A sweet dish prepared with wheat flour, Jaggery, a generous amount of ghee, Indian herbs and spices which are considered as a medicine according to Ayurveda, so this dish is on more of a health benefits side. Around the world in many countries with different cultures, people from all backgrounds have their own food remedies to have in cold winter times as energy boosters. There is a saying in Gujarati ' Je Shiyala ma khay pak, tene na lage thaak' translates as 'if one eats good winter warmer food during winter, that person will stay full of energy' In my hometown of Gujarat, families traditionally starts to prepare winter warmer dishes that will help in keeping yourself healthy and fit as soon as the first sign of cold weather appears. The youngsters of the family rely on the very elderly for help and advice on how to go about making these or they use very old recipe books. 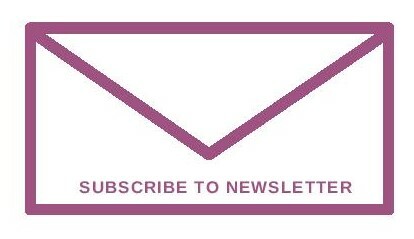 According to many Vaidya (Ayurvedic practitioners), they advise that people should eat a specific type of foods which provides them energy and keep the health of mind, body, and spirit free from diseases, so if these winter warmers are consumed in the cold season it will actually help you healthwise during the rest of the year. As we all know that we seem to burn more calories in winter as our body needs more fuel, it is advisable to consume high energy foods such as nuts, ghee ( clarified butter), Jaggery and whole grains. In Ayurveda, these special winters warmer foods such as Methi Paak (Fenugreek Bars) , Gundar Paak ( edible gum bars ) Saalam Paak ( herbs and spices bars) Katlu and many more healthy bars of this type are given the utmost importance. The contents of these bars are very specific in providing heat to the body and keep the immune system good, so these are very useful to consume during the cold and harsh weather. So What is Katlu? you may ask. Well, family and friends would not hesitate to make these for you if they find out that one has just given birth, it is very familiar to consume by the new mother after giving birth as it has lots of healing and strengthening properties. It works magically to get you back on your feet. But having said that Katlu can be consumed by anyone during the cold weather as it is packed with powerful ingredients. The main ingredient of this Katlu recipe is KATLU OR BATRISU POWDER which is a blend of 32 types of Indian herbs and spices. Also, Ingredients such as methi, edible gum, and ginger helps in strengthing of the backbones and joints. Desi Ghee and Nuts provide protein, fats, minerals and a rich source of energy. 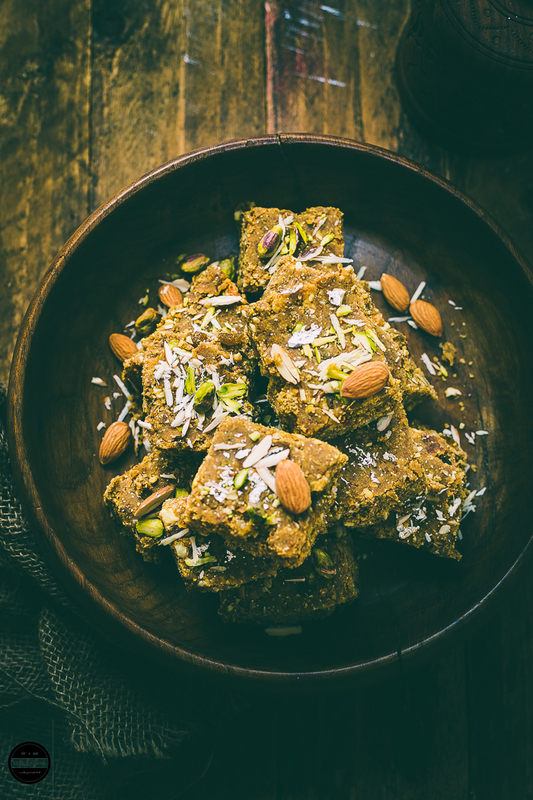 These traditional and rustic looking Katlu bars appears sweet in taste but with a sharp distinct flavour which takes time to get used to as it is quite overpowering. 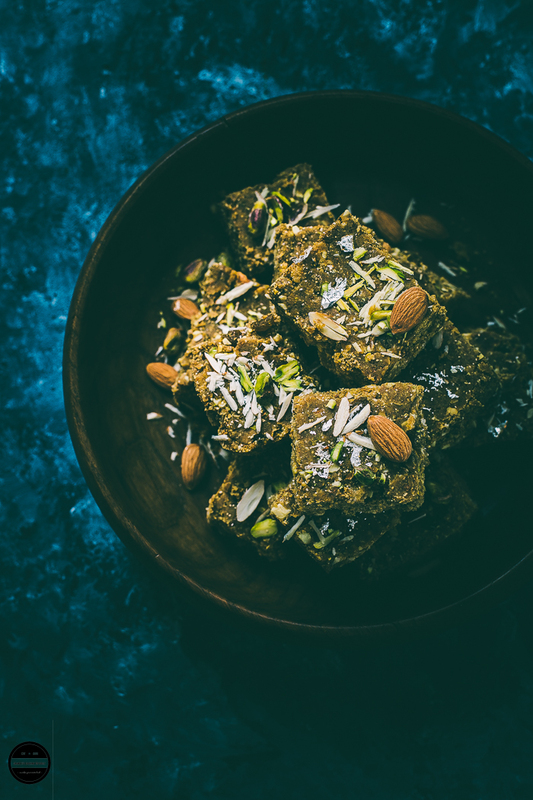 Katlu is all in one, energy bar you will need as it contains each and every beneficial ingredient that will do the job so no need to make other various time-consuming winter warmers. 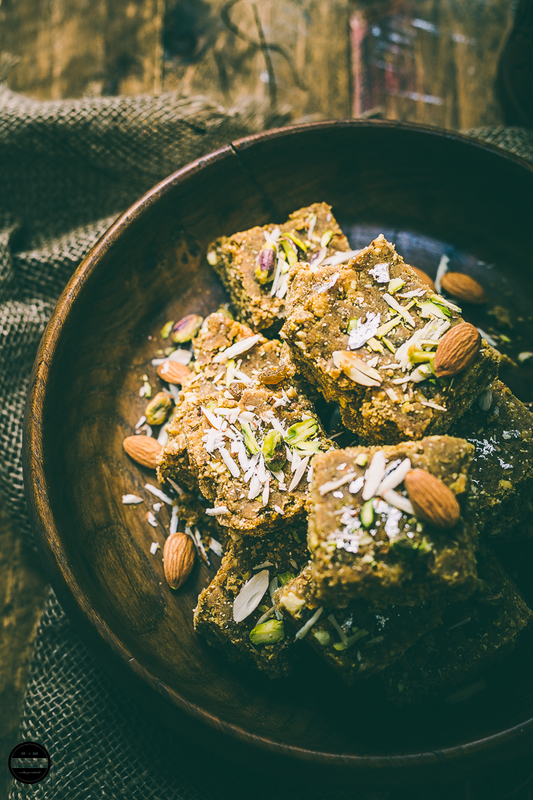 Katlu is a Gujarati style winter warmer wholesome bars. These bars are prepared with wholesome ingredients such as Nuts, Indian herbs and Spices, Wheat flour and jaggery. One a day in winter keeps you warm and energetic. On a previous night heat 250g ghee and add methi powder and mix well, leave it aside whole night. Next day morning start preparing katlu. In a big and wide plate place mixed nuts, raisins, dates and figs, cardamom, nutmeg and katlu powder. Mix well. Heat about 100g ghee in a kadai, and fry edible gum and add into the mixed powder plate. Now add more ghee(250g) and heat and add wheat flour and fry on a very low heat until nice and pink. It will take about 18-20 minutes. Transfer fried flour into the plate, straight away add soaked methi powder as well. Mix everything so well. Now heat remaining ghee in the same pan, and add jaggery and make jaggery syrup without any water. It will take about 5-7 minutes. Meanwhile keep a greased tray or thali next to you. Pour jaggery syrup on the prepared flour mixture and quickly mix. Transfer katlu mix in the greased tray and spread evenly. Sprinkle almond and pistachio slivers (optional) and let it cool for an hour. Then cut into the desired shapes. Once totally cooled down, store in an airtight container. Consume ONLY 1 piece every morning with a glass of milk. Enjoy! Katlu or Batrisu powder is available in any Indian grocery store or online. Sheer torture as i scroll through the images and read the recipe. 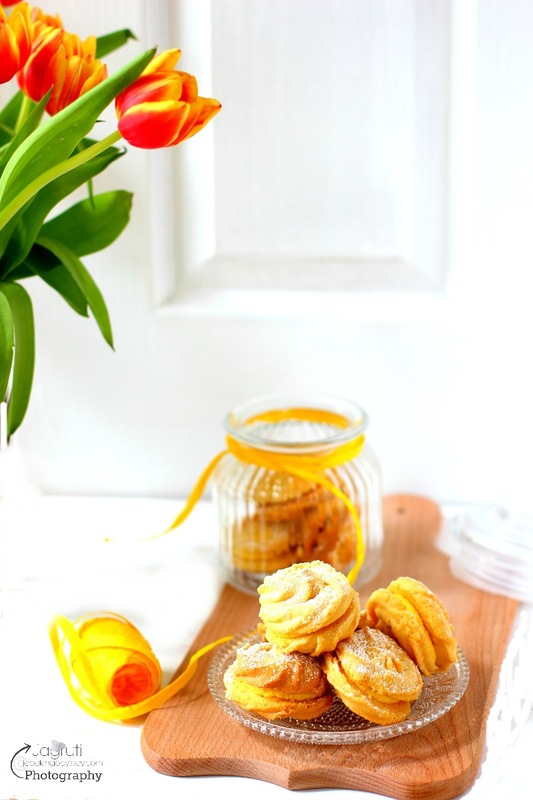 I simply love homemade sweets and seasonal specials like these are totally yum! Wish we could exchange few pieces my dear. Thanks Sonal! On it's way :) Enjoy! Thanks Ruchi :) One of my favourite too! I love Gujarati dish names. They really are very desi. Your info on this is very helpful and indeed essential. Would love to make these katlu and will check for katlu powder when I go to the market. Or will ask a gujju friend to get it for me. Thank you Jagruti for the lovely clicks and adding my recipe. Seriously, every tile I come her to comment I am just lost, scrolling up and down looking at the pictures. They are stunning. You definitely have to do a post about tips for food photography. Love reading about this Guju special sweet and glad you learned to make it just like your mom. wow this sound like gond ke laddu except one ingredient. Looking mouth watering recipe, it has been in my bookmarks since long time. For any gujju dish I come to you. Looks delicious with all the goodness of nuts. Nice share. Beautiful clicks that make the katlu appear super tempting. I love katlu but have yet to make it at home. I always get some from my best friend's mother in law. Looks so healthy and tempting.